Celebrational & Inspirational Festivities as we Re-dedicate Plymouth’s pipe organ on Sunday, February 17, at 4:00 PM. Larry Wheelock, and former Plymouth organists Jayne Latva, Ingrid Pierson, and Charles Sullivan will entertain us with a concert, which will be followed by a Reception and Silent Auction. 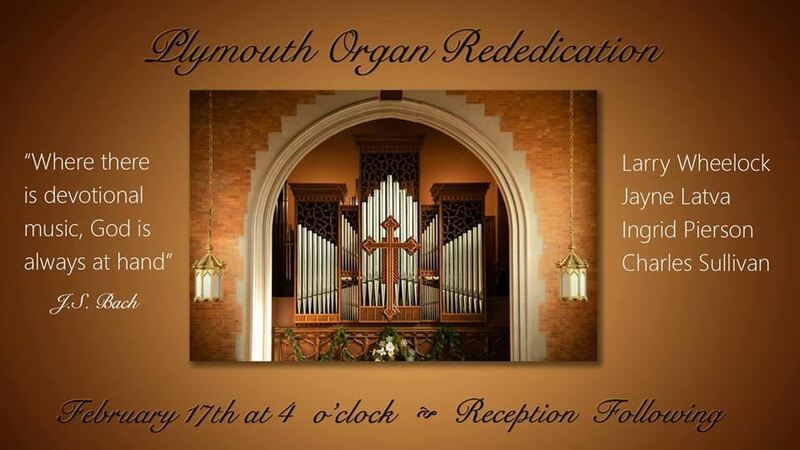 This concert is more than just a wonderful way to experience the “Better than New” organ, it’s a Thank You to Plymouth’s Members and Friends who supported the organ project with donations directly to the organ fund or via memorials in honor of the special people who called Plymouth home. Please join us for an afternoon of Music and Merriment!